In 2011, a volunteer working group of Black gay men established ManDate/Project Healthy Living (PHL) to combat the myriad challenges that negatively affect their health and well-being. PHL aims to fill a void in leadership and activism in response to the HIV epidemic among Black gay men. ManDate is a systemic game-changer for health outcomes for Black gay/bisexual men. Over the years, the program has rendered PHL as part of its continuum of programs, services, and activities designed to change healthcare delivery systems and strengthen the Black MSM community. 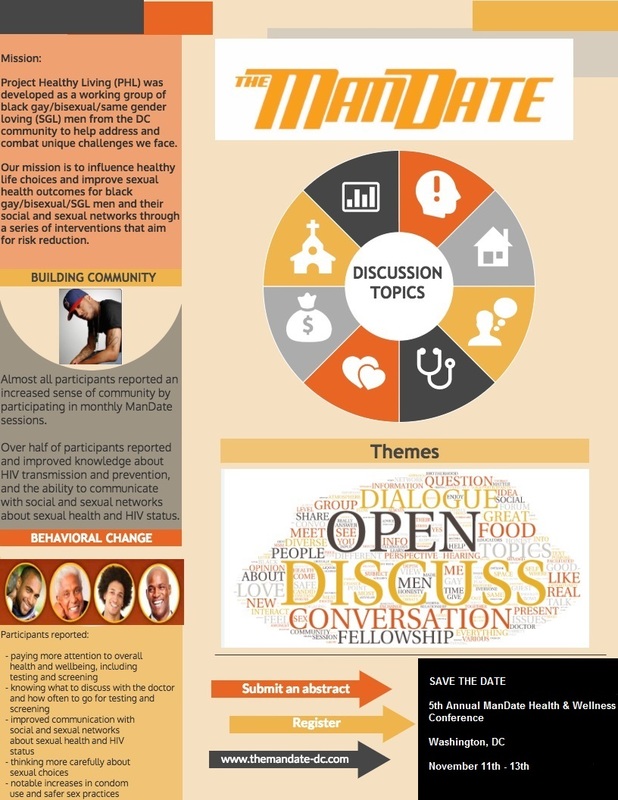 The ManDate is not a support group; rather, it is a multigenerational, multiexperiential, and multicultural collective of men committed to maintaining positive and engaging spaces for Black gay men to openly explore issues relevant to holistic and sexual health, healthy relationship-building, and personal and professional development/growth. Originally developed in the Washington, DC, metropolitan region, PHL has developed toolkits for interested parties in other jurisdictions, enabling them to readily adapt The ManDate sessions. "I am so very grateful for that meeting and the information I received."